Find a path and follow it to see what’s just around the bend. 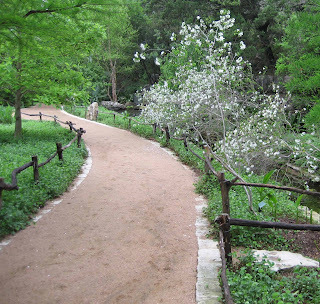 This particular path is in Zilker Park in Austin, Texas, about 1,098 miles from my garden. 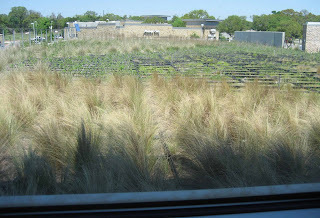 I visited it with Annie in Austin and Melissa from Zanthan Gardens the morning before the first Garden Bloggers Spring Fling officially kicked off last April, one year ago this week. I saw a lot of plants along the path and smelled a few flowers that won’t grow in my own zone 5 garden, including this Michelia figo. 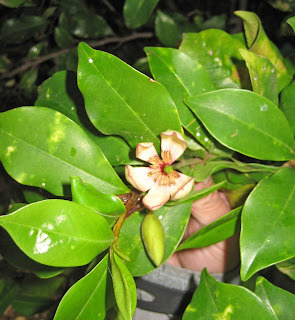 I remember that Annie and I discussed how Michelia should be pronounced, and we each had our own ideas on that. In fact, when I said it out loud, Annie seemed a bit taken aback because she had been pronouncing it quite differently. Melissa decided that I had learned botanical Latin, and Annie favored ecclesiastical Latin. But regardless of pronounciation differences, we talked gardening non-stop in a universal language that we all understood. I’m grateful to Pam/Digging who led the planning efforts for the first spring fling. 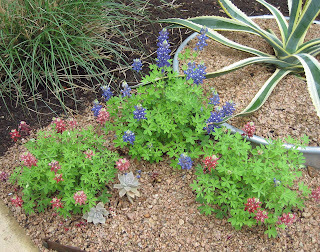 It was almost surreal to be in her Austin garden, seeing her pink bluebonnets. She was the one who encouraged me to attend and assured me it would be fun times. And she was serious, and came up with the original idea to have a big meet up of garden bloggers and invite everyone. Did you know that those letter posts that Dee and Mary Ann and I have been “exchanging” each week on our blogs would probably not be written, were it not for them also finding the path to Austin last spring? Mary Ann and I, along with Pam/Digging, Cindy T., and Susan H., ended up in the same car as we drove around Austin to gardens and garden centers. At an impromptu stop at a Starbucks with a green roof, I introduced Mary Ann to Starbucks iced green tea (IGT), the most refreshing beverage ever brewed. We had a dinner at the end of spring fling, and both Dee and Mary Ann ended up across the table from me. We had some nice conversation that evening, and Mary Ann explained to me why I should not hesitate to fly. One thing led to another and Dee and Mary Ann and I have continued to keep in touch via the Internet. Somewhere along the way, we came up with the idea of the weekly letters to compare and contrast our vegetable gardens throughout this season. 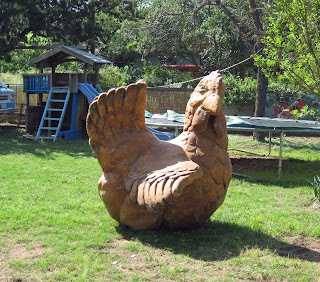 Sometime on Friday afternoon of the spring fling weekend, Melissa took me by this big chicken in someone’s yard near her house and garden. The owner came out and was very nice and hospitable and even turned the chicken around for me so I could get a good picture. I’m glad I wasn’t a big chicken about flying to Austin, even though I don't like to fly. I think everyone who went or met up with us that weekend had a great time, not only seeing gardens but exchanging ideas with one another. Later this spring, garden bloggers are meeting up again, this time in Chicago, Illinois. I know many who were in Austin plan to be there, along with many other garden bloggers. If you are a garden blogger and you haven’t already decided to come (and many have), please think about joining us in Chicago May 29 – 31. You'll have a great time, see lots of gardens, and get a chance to talk gardening nearly non stop with fellow garden bloggers. Find a path, a path you normally wouldn't take, and follow it to see what’s just around the bend. There is such an active blogging community in America, I don't know anyone else who writes an Allotment blog in N.Ireland! Your trip sounded great, imagine being able to go and see Spring in the same country you live in and don't have spring yet! Mindblowing. Very enjoyable 1st visit to your blog. Goodness you ARE popular girl! I am so glad we met up in Austin, each and every one of us. I especially cherish my friendship with you and Dee, whacky we may be, but having fun in and out of the garden. I do believe I've become a better gardener by knowing you and the folks I met. It's the constant support and encouragement that keeps me growing (pun, yes, intended)! I'll buy you a delish IGT in Chicago. Maybe several. Hi Carol, this was a wonderful reminder of the fun we had last year and the fun we are looking forward to this year in Chicago. Like you, I do not enjoying flying. I don't even like to travel at all. I don't like to leave my house and garden, but do it every week and am always glad for the experience. Going to Austin after only just beginning to blog a few months was a big leap off the cliff for me and it was life changing. For anyone considering going to Chicago but full of doubts, cast them aside and follow that path! Looking forward to visiting with you again, Carol. What a great time we had! When Pam first announced it, I was convinced there was no way I was going to be able to go. But somehow the planets all aligned and I went. I'm so glad I did. You and all the people I met there are just the best! Sniff! What a nostalgic post about our magical weekend last year at Spring Fling. It really was wonderful to meet you, Carol, and everyone else who took the leap and joined us. The path is paved now, and it won't be scary to meet a bunch of strangers, not least because we aren't really strangers if we know each others' gardens. Oh, Carol! This nostalgically potent post hit me while I was still teary from being at the Leonard Cohen concert last night. Now you've got me all teary for a different reason! Wish I could be with y'all in Chicago - it should be a wonderful time for all of you. You're making me feel all sentimental. Last year's Spring Fling was such an amazing event. There we were all hesitant, all of us (mostly shy) garden bloggers among strangers who turned outn not to be really strangers at all--because we'd known them before we met them, thanks to their blogs. So instead of all those awkward introductions and cocktail chit-chat we just plunged headlong into days of non-stop conversation. I had every intention of following up by going to Chicago this year. I even planned an extended vacation with AJM so that we could explore some of Chicago afterward. I love Chicago and I really wanted to see everyone again and meet the newbies. Unfortunately it is the same time as another major trip and I won't be able to go. So y'all better take a lot of photos, write a lot of posts, and tweet a lot of tweets. I, too, thought the Starbucks green ice tea was the most refreshing, until I found Teas'Tea which you can buy at Target and upscale grocery stores. Give it a try. She is also the person who provided goat pellets for my raspberry bed from her (live) three-legged goat. All, thanks for the very nice, heartwarming comments. I look forward to seeing some of you again in Chicago and meeting some new bloggers, too. MSS, thanks for the info on the artist who made the chicken. I've had that picture for a year, waiting for the right post to include it on. I can't wait to meet you Carol. I will be able to go to Chicago. It is too bad I have to go all the way to Chicago to meet you when you live not too far from me in INdy. What a wonderful post, Carol ... I'm smiling in memory of the wonderful times we had in Austin and in anticipation of those we'll enjoy in Chicago.